The new report by Zion Market Research on the “Paper Chemicals Market By Product Type (Bleaching Chemicals, Pulping Agents, Sizing Agent, Binding and Coating, Strengthening, Retention and Drainage, and Other Chemicals) – Japan and Korea Industry Analysis, Size, Share, Growth, Trends, and Forecast 2016– 2025" has a vast information about the market and its potential. The Japan and Korea paper chemicals market were valued at USD 3,500 million in the year 2016 and it is expected to reach approximately USD 5,100 million by 2025. The Japan and Korea paper chemicals market are expected to exhibit a CAGR of more than 4% between 2017 and 2025. Increasing applications of the paper in several end-user industries and the growing demand for the high-quality paper are the major factors driving the paper chemicals market in Japan and Korea. According to the statistics, Japan holds the third position in the global paper production. Increased use of paper products while reducing the usage of plastics is another factor that increases the demand for the paper chemicals in Japan and Korea. Moreover, the growing retail and e-commerce activities and growing structural need of paper in the packaging industry is expected to propel the growth of the paper chemical market in Korea and Japan. Our research analysts came up with the conclusion that, the market is anticipated to grow significantly in Japan. In 2016, the paper and paperboard exports increased by 14.4% than 2015 and set a high record of 1,553 thousand tonnes. These exports were major to the Asian countries. On the other hand, the imports declined by 10.8%. Thus in Japan, the paper chemicals market will witness a significant growth owing to its huge paper production. The Japan and Korea paper chemicals market are segmented on the basis of the product type and countries. By product type, the bleaching agents contributed the major market share of around 28% in 2016. It is also anticipated that this dominance will be retained in the forecasted period owing to its highest growth rate. It is expected that the bleaching chemicals segment will register a CAGR of over 4.4% in the forecasted period. The increasing requirement of bleaching chemicals for improving the quality of the paper is the key factor increasing the demand for the bleaching agents in the paper chemicals market. Some of the widely used bleaching chemicals include chlorine gas, hydrogen peroxide, ozone, peracetic acid, oxygen, chlorine dioxide, etc. The other products that are expected to witness a good growth rate are pulping agents and strengthening chemicals. Pulping agents help in breaking the internal bonds of the woods. Whereas, strengthening chemicals provide physical and chemical strength to the paper. As these chemicals improve the paper strength they are increasingly used in papers that are majorly used in the packaging industry. Japan has registered a major share of around 60% in the Japan and Korea – Paper chemicals market in 2016. Japan is the third largest producer of paper globally, and this is expected to propel the growth of the paper chemicals market in the country. 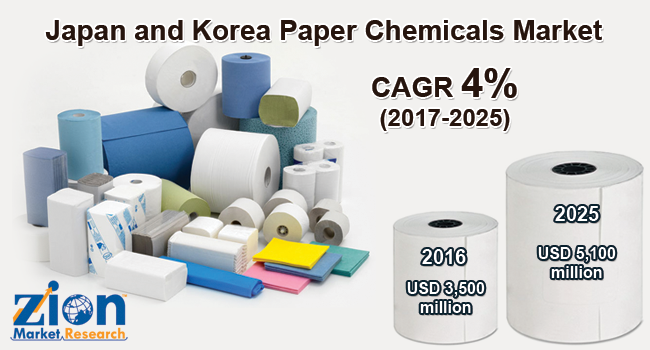 Moreover, a high manufacturing base for paper chemicals in the countries is expected to significantly contribute to the growth of Japan and Korea–Paper chemical market. The major market players in the Japan and Korea – Paper chemicals market are Clariant, BASF, Evonik Industries AG, Kolb, Imerys, Kemira, The Chemours Company, ivaxchem.com, Anmol Polymers, Vipul Chemicals India Pvt. Ltd., Orient Packagings Ltd., Arjun Chemicals (I) Ltd., and The Dow Chemical Company, among others.